“Sunshine is always on the other side, be brave to look forward and face the music of life,” says a very brave hero of the real world - Mr. Leonard Chua. A highly energetic young man, Leonard was full of dreams. Starting his career as a Food and Beverage staff at Century Mahkota Hotel in Malacca in 1998, he jumped to fly with his dream by working with Malaysian Airline System as an air steward and also did part time modelling until 2001. In 2001, letting his dreams take another flight, he left the MAS and became a body builder- model- turned entrepreneur. During the years 2001 to 2005 he was involved in managing an entertainment outlet, selling insurance, selling cars, and network marketing in a couple of direct selling companies. Leonard gained a lot of experience and skills in sales & marketing, and operations & management during this period of his life. On October 6th, 2005, Leonard drove from his hometown Malacca to Kuala Lumpur to meet up with a potential partner about a new business venture that was worth RM5 Mil. That very same night, he met with an accident on Federal Highway. It was to change his life forever. “I just wonder what I would be; my life was totally changed overnight! I was paralyzed from armpit downwards! !” he narrates. At that moment he could only wish that the accident didn't occur to him and he wasn’t bound to the wheelchair thereafter. But, maybe he couldn’t sense what fate had decided for his life. On getting back home from the hospital in Malacca the challenges weren’t any less. There were no rehab centres. He felt defeated but also lucky enough to be blessed with supportive family and friends. “My mother has played the most prominent role in my life; she gave me the unconditional care and love. It’s been 9 years but she has kept herself strong and always been by my side. It was her love that gave me faith and strength to be alive to which I am thankful each day,” he says. During these years, Leonard had two cardiac arrests that lasted for ten minutes and three minutes respectively. Technically he was dead during those minutes and during the first attack, the doctors were about to turn him down. He was lucky to have been resuscitated and survived both attacks after which he was admitted to the ICU of UMMC (University Malaya Medical Centre) for one and a half months followed by 4 months in the normal ward for rehabilitation. Leonard’s friends and care-takers made simple rehab equipment as the tilt table and hand cycle to carry on with the efforts to keep him motivated. But with a hope to gain back the function of his body he worked very hard for two solid years. 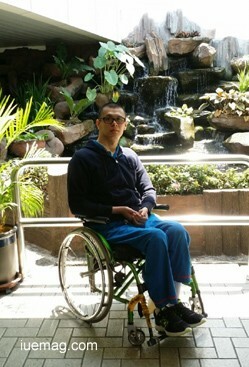 “Even though I did not stand up, I had improved to gain back upper limbs’ function and it’s fully functioning now. I was classified a Spinal Cord Injury level C6-C7 and improved to level T1 complete paraplegia,” he says. The thought of unavailability of a rehab centre there with the basic maintenance exercises, forced him to think about the others who needed that just like him. This gave birth to Beyond Rehab Wellness Centre. His purpose of forming this NGO is to bring hope to all the People With Disabilities (PWD) including the abled people by proving to them that there is hope if we don’t give up. “Beyond Rehab Wellness Centre is a place to share and motivate each other after the mishap. Most importantly, we must have this message clear- we can still lead our life and function with “another way”; if we did not give up!” says Leonard. To assist with the capabilities of self-management of daily basic needs. To educate the young and youth to be responsible for themselves so that they don’t repeat my mistakes. “Nevertheless my God brother, Mok was the one who showed me the light when the lights were dim, he gave the words that really touched and inspired me; if I couldn’t walk he would lend me his legs to accompany me in my journey. He has proven his assurance until today; we are still sailing on the same boat to achieve my DREAM that is Beyond Rehab Wellness Centre,” says Leonard with gratitude. Leonard used to slur his speech due to the after-effects of hypoxic brain injury (lack of oxygen in the brain due to the two cardiac arrests); nobody could understand what he said. He had to undergo speech therapy, and today, he is a motivational speaker and he has been speaking in several corporate companies. He also visits schools and universities to share and educate the youth for not repeating his mistakes. I am a mirror for them for being irresponsible. According to Leonard, the people need motivation to have a positive attitude towards the phases of life and have strength regardless of them being able or disable. During his free time, he likes to visit those similar patients in UMMC (University Malaya Medical Centre). Besides that, Leonard also does home visits and teaches patients on how to manage and take care of themselves after SCI (Spinal Cord Injury) when they are discharged from the hospital. During the home visits, Leonard also shares his exercise methods which he does at home daily which keep him fit and well maintained. In early 2010, Leonard had been nominated as one of the ‘50 CLEO’ most eligible bachelors of the year and that made him the FIRST disabled CLEO bachelor finalist in Malaysia. The following year, he was awarded the title of ‘Ten Outstanding Young Malaysian Award’ in the Personal Improvement and Accomplishment category. In 2012, he was awarded the ‘F & N Outdo Yourself Award’ in Civic Consciousness and Compassion category along with the ‘Prestige Top 40 Under 40’ award in the Community Service Award and in 2013, Leonard bragged the rights to the ‘Guang Ming HERO Award’. Being an optimistic person, Leonard has never stopped seeking more opportunities to improve himself to be a better person and lead a better life. Leonard’s main area of work is focusing on education. He believes it is important to begin with a healthy and proper foundation of education with young minds. “I would be where ever and whenever I am needed or invited, especially, to share in a school which I believe is a temple of education, I do” says Leonard. “Do not give up easily! The journey in life is always full of ups and downs; never be afraid to face challengers. Nothing can stop a person from moving forward unless he/she gives up.” - saying this he also informs about his upcoming book which will inspire a lot of people whether they are abled, disabled, young or old. Any facts, figures or references stated here are made by the author & don't reflect the endorsement of iU at all times unless otherwise drafted by official staff at iU. This article was first published here on 5th April 2015.